Shouldn’t come as too much of a surprise considering that Monolithsoft, the developers of Xenoblade, were also the developers of Namco X Capcom. Famitsu also divulged some info on some of the battle systems in place for Project X Zone. Like its predecessor, battles are a mix of Strategy RPG and action. You move units around on a grid and engage enemies. Here, the battles then switch to a 2D perspective where you use the control pad and “A” Button to execute moves. You’re encouraged to use different abilities and use them all in one shot. You build up a meter at the bottom to unleash special moves. It’s shared amongst all party members, so use it wisely. 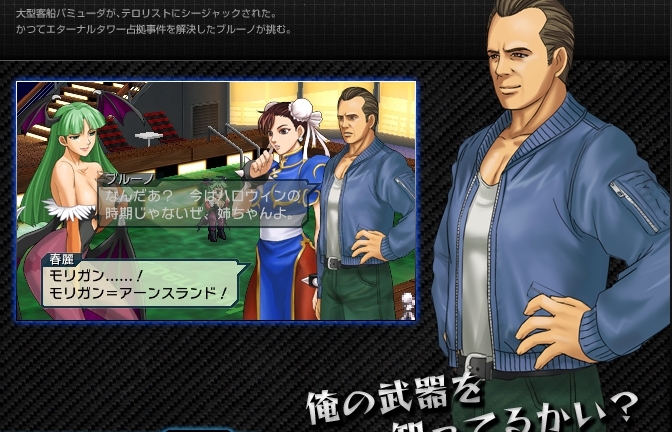 Along with this news, more characters have been revealed for Project X Zone. First on the Capcom side, Morrigan has been added to the Darkstalkers team. Chun-Li joins Ryu and Ken for the Street Fighter team. On The SEGA side, Erika and Gemini join the Sakura Wars team. This makes it the biggest team so far. And holy crap, is that John McClane from Die Hard Arcade!? Well kinda. In Japan (where it was made and first came out), it was called Dynamite Deka, and the guy was named Bruno. You can read up on that here. Finally on the Namco Bandai side, the Valkyrie from The Adventures of the Valkyrie joins alone. And finally Haken and Kaguya from Super Robot Taisen OG Saga: Endeless Frontier join the fray. Project X Zone is slated for release on the 3DS some time this year. Character art after the break. This entry was posted in Gaming News and tagged 3ds, Capcom, Darkstalkers, die hard arcade, dynamite deka, Monolithsoft, namco, Namco Bandai, nintendo, project x zone, sakura wars, sega, still likin' that music on the website!, strategy rpg, Street Fighter, super robot wars, the adventure of the valkyrie, valkyrie no boken on May 17, 2012 by Steven T..